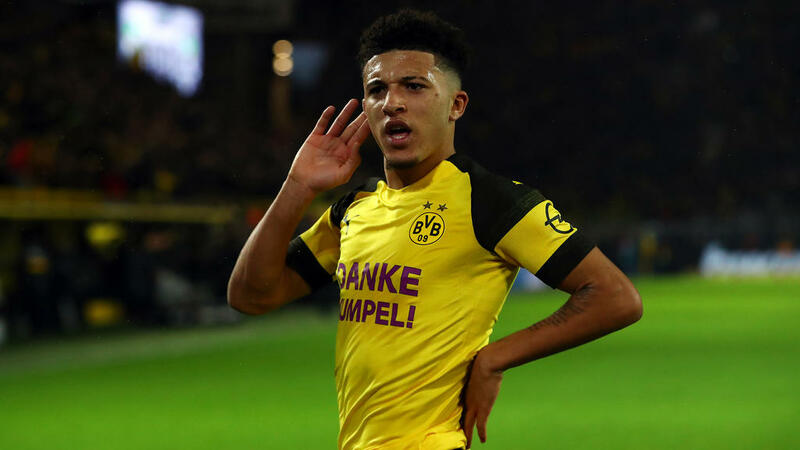 Despite becoming a full England international and Borussia Dortmund star at just 18, Jadon Sancho insists his seamless transition after a groundbreaking move to the Bundesliga leaders has not come easy. The south London-born forward has netted seven goals this season, creating 12 more, in all competitions and has forged a potent partnership with Germany star Marco Reus for Dortmund. Sancho's bold decision in August 2017 - when he was just 17 - to leave Manchester City has paved the way for a flurry of British youngsters to head to Germany, looking for more game time rather than being stuck on the bench at their Premier League clubs. England Under-21 star Reiss Nelson, 19, has scored six goals at Hoffenheim on loan from Arsenal, Welsh winger Rabbi Matondo, 18, joined Schalke last month from Man City and Emile Smith-Rowe, 18, has swapped Arsenal for a loan spell at RB Leipzig. "I feel like young players are looking to go away now, because they are seeing my success, but it's not easy," Sancho told AFP. "People think that because I am doing so well, but everyone's journey is different. "Mine was just to come out here and to work on me. "I couldn't speak for other young players, but they are probably giving it a thought now." The teenagers first met playing in the same under-11 team at the 2011 Southwark Youth Games in London. "We go way back," said Sancho. "It will be very nice to stand on the pitch with him on Saturday. "I hope we get that opportunity, it will be a nice memory for our families, coming from the same area and hopefully being proud of us." "He would say him, I would say me," laughed Sancho. The move paid off as he made his full England debut last October. "I felt at the time I needed something different," he explained. "Borussia Dortmund were the club I chose, I thought this will be my new home and I'll work very hard to prove myself." Even the mighty Bayern failed to handle him and Reus in their November showdown as the latter scored twice in Dortmund's famous 3-2 home victory. Sancho played his part in Dortmund's winning goal, tracking back to dispossess Franck Ribery and start the move that ended in Paco Alcacer finding the net. He describes Dortmund team-mates like Reus, Mario Goetze and Belgium midfielder Axel Witsel as "role models" who help him "improve every day". Dortmund's director of sport Michael Zorc admits the teenager's consistency caught him by surprise. "I haven't been surprised by his performances, but with how fast he managed to get to this senior level, because before that he only played for youth teams. "Also the stability of his performances, he played nearly every game for us last autumn, always at a high level, but he could still play in our under-19 team - that is unbelievable for me." Dortmund face Tottenham Hotspur away in next Wednesday's Champions League last 16 first leg and Sancho is relishing returning to London with his German club. Playing in front of his family and friends in his home city is "something I've always wanted to do since I was a young boy," the teenager said.